We’d love your help. 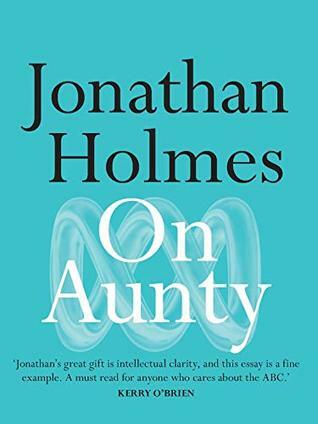 Let us know what’s wrong with this preview of On Aunty by Jonathan Holmes. To ask other readers questions about On Aunty, please sign up. I make no secret of the fact that I am a fan of the Australian Broadcasting Corporation, and am an avid consumer of many of its products. I don't always agree with some of the reporting that comes from the ABC - and in fact some of it I've been quite outraged by mistakes, errors, and proffered analysis. That being said, however, I believe that the ABC is increasingly necessary for contemporary Australian society in light of the increasing polarisation of other media organisations. Though there ha I make no secret of the fact that I am a fan of the Australian Broadcasting Corporation, and am an avid consumer of many of its products. I don't always agree with some of the reporting that comes from the ABC - and in fact some of it I've been quite outraged by mistakes, errors, and proffered analysis. In this short book (more a long essay than anything else), Jonathan Holmes, himself a long-term employee of the ABC, takes an honest look at the recent turmoils of Australia's public broadcaster. It is a sympathetic yet honest assessment that Holmes produces, not being afraid to acknowledge mistakes as he sees them while also calling out some of the obvious threats from outside the organisation that present a challenge to the very existence of the ABC.